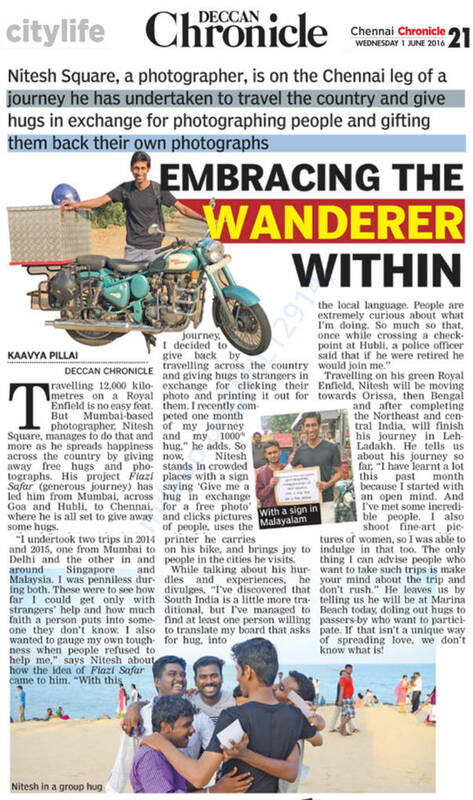 As some of you are aware that last year - Fiazi Safar 2016, I travelled for 15000 kilometers on motorbike across India for 4 months to collect hugs and spread happiness with a board which will say "Give a hug, get a free picture". You will find more about it below. 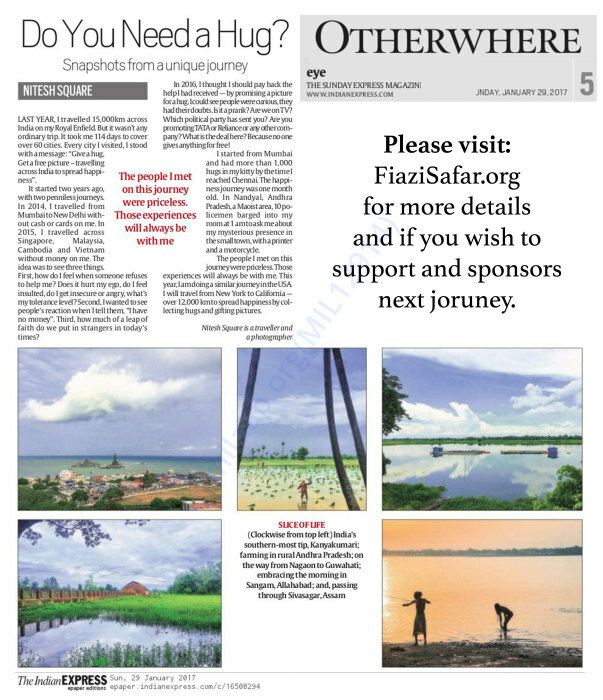 About Fiazi Safar: I have been doing penniless journeys since 2014: the 1st one was in India (2014) and the 2nd in Southeast Asia (2015). The idea was to see how one feels when someone refuses to help us. Does it hurt our ego, do we feel insulted, do we feel insecure, do we get angry, what's our tolerance level? I also wanted to see people's reaction when one tells them, "I have no Money". How much of a leap of faith do we put in strangers in today's times? 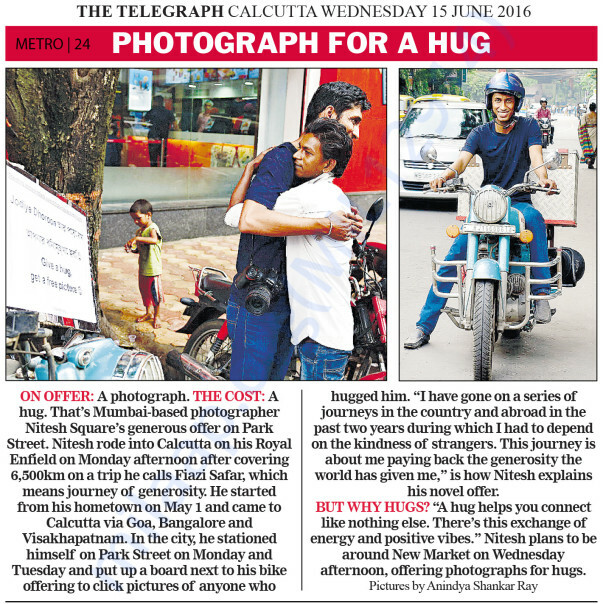 You can gift hugs and pictures to strangers I meet: With the support of your every INR 500, your name will be written under one picture. LIKE, For eg: This picture is gifted to you by "Name/City"
Fell free to email me on fiazisafar@gmail.com for anything. 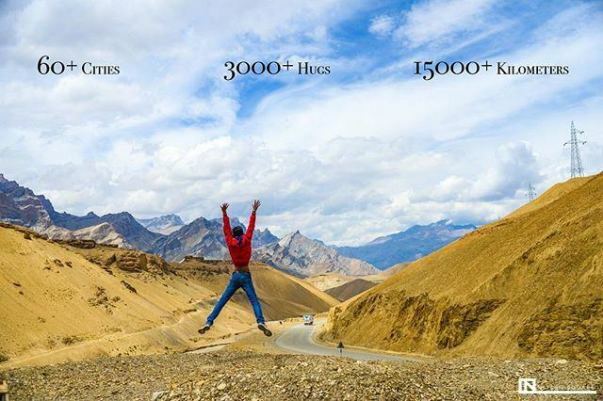 Nitesh is a Photographer, Writer, Speaker and Traveller. He believes that his art should as many as possible without any monetary hurdles. In early 2009, he started experimenting with his camera and by the end of the same year he had become a Professional Photographer. He still calls Photography his Passion not his profession. He based in Mumbai, India but travel all over the world for the love of art. Prior to Photography, Nitesh was a Journalist for The Indian Express and DNA in India. He is currently based out of Mumbai but travels through Asia and around the create memories. Once in a year he does Fiazi Safar; which means he travels thousands of miles without carrying any money on him to experience the World of Humility. How does one feel on denial of help? Does it hurt our ego, do we feel insecure, do we get angry and what is our tolerance level. Also to see how people react to a stranger with empty pockets. In todays day and age, how easy is it to put faith in strangers? 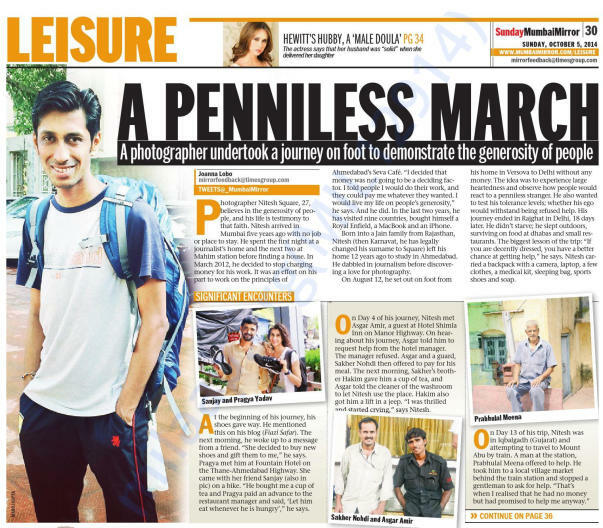 For his Photography, he follows the Giftivism philosophy which means "Pay from your heart, Pay what you can, Pay it forward”, which essentially means your assignment charges are already paid by someone else in the past and in order to continue this cycle of art and giving, you pay whatever your heart says. This philosophy hasn't allied him since April 2012 and it continues to give him spiritual satisfaction further on. 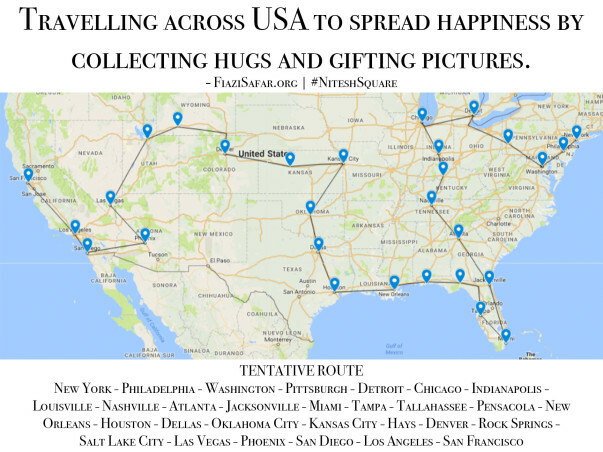 The fund will be used to travel and spread happiness by collecting hugs and gifting photo print in return. We me July 1, 2017 while observing city workers installing permanent rainbow crosswalks on my favorite street corner in Atlanta. You shared your story, we embraced, and then you photographed my love and I in front of one of the lovely rainbows. It's been months since that day, and I've moved across the world to Southeast Asia, yet I still remember that day and your mission. Please accept this donation with the hope that you continue to touch hearts worldwide. Go get 'em!! Great ambassador for India!!! All the best Nitesh...have a great time...spread happiness! !